These allows guests with EU chargers and power leads to plug these in directly to allow charging and operation of your equipment without the need for an adapter. 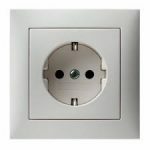 These ‘Schuko’ sockets, located in all guest areas, allow you to power devices rated up to 13A (3100W at each outlet) at 240v (nominal) at 50Hz (cycles). This reduces the need for an adapter to UK 13A Square pin outlets.